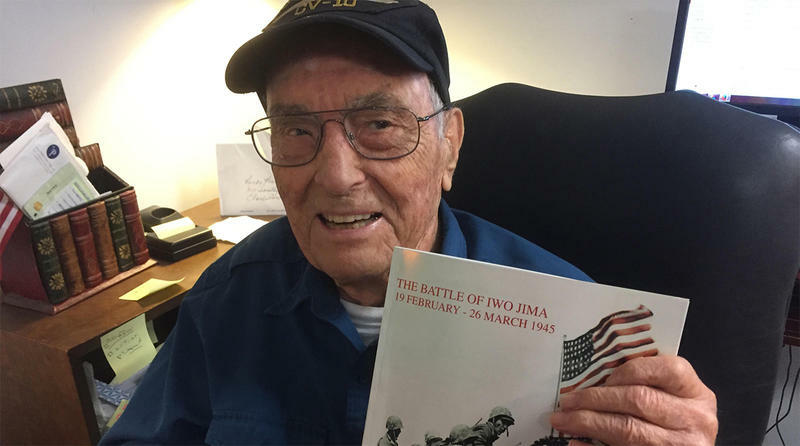 World War II veteran Marvin Veronee of Charleston with a photo book, for which he wrote the text, on the Battle of Iwo Jima. Veronee was in the battle as a 19-year-old sailor. In February and March 1945, one of the most significant battles of World War II took place: Iwo Jima, just 760 miles from Tokyo itself. Among the 70,000 marines assigned to the operation was 19-year-old Marvin Veronee of Charleston, a navy gunfire officer who went ashore with the Marines to call in fire from warships stationed off the coast when he found good targets. 75 years later, a 93-year-old Veronee recalls his duties in the battle, his narrow scrape with a Japanese banzai charge ( a suicide attack), and his sight of the first (not the second, world-famous) American flag raised on Mount Surabachi.